Mental Health is a highly contentious concept and an area of study which is often bewildering to new students and trainee practitioners. In this context, provides a much needed guide to the central topics and debates which shape contemporary views about mental health and illness and which govern the provision of services for people with mental health problems. The fifty concepts featured in this book are examined through a multidisciplinary lens, drawing together perspectives from sociology, psychology, psychiatry and ethics. Part One examines the contested nature of mental health and mental health problems and includes traditional psychiatric descriptions, as well as rehearsed criticisms of them. Part Two focuses on mental health services, the ways in which mental health work is organized and the professional interests involved in service delivery. Part Three addresses a range of topics related to mental health and society, and places mental health within its social context. 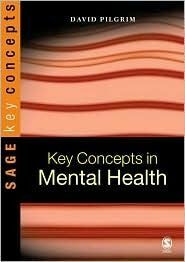 is an ideal text for those studying mental health in a range of disciplines as well as those training to work in mental health settings. The entries provide both clear descriptions and critical reflection on key issues relating to mental health. Each concept is fully cross-referenced to other related terms and is accompanied by suggestions for further reading.